If you’ve caught the news recently, you’ve likely seen Facebook in the headlines. After a reported “data breach,” connected to the company’s relationship with Cambridge Analytica, went public, Congress called upon Facebook’s CEO for explanation. They went on to discuss, in detail, how Facebook uses consumer data to power advertising, and how users’ personal information is affected. 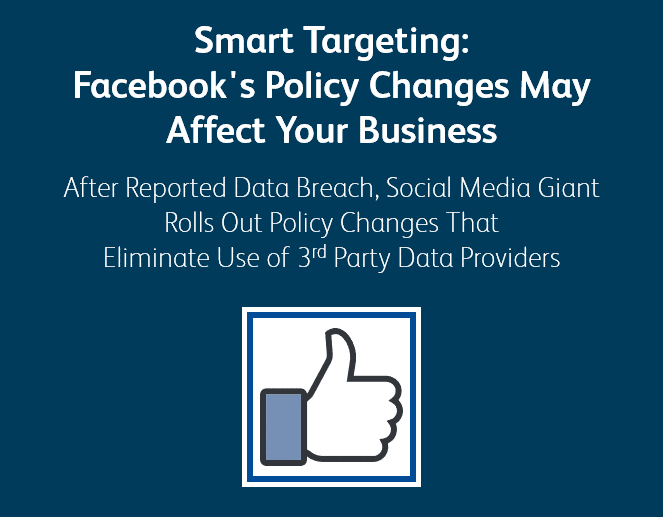 Facebook used this very public summons as an opportunity to refresh their policy on data use and its availability to Facebook advertisers. How does this affect Search Optics’ Clients? Search Optics’ in-depth/super-intender targeting capabilities have often been at the forefront of conversations with our clients in the automotive space. This targeting allows us to narrow down an audience based on purchase behavior, so that ads reach individuals who are likely to respond to them. As an example, we caan target an audience comprised of in-market auto shoppers to push out special promotion ads only to people actively shopping for vehicles. This results in more accurate metrics and efficiency for our clients while creating a relevant experience for online shoppers. Facebook no longer provides the ability to target ads based on such granular data; however, Search Optics intuitively prepared for this shift. Earlier this year, we pivoted our approach for efficiently targeting users, focusing on 1st party/proprietary data for smarter targeting. In addition to utilizing more accurate and relevant data, Search Optics’ solution is a critical lynchpin strategy when it comes to properly and legally using personal information. Proprietary data is the future of smart targeting. We work with our clients to acquire important information that is both relevant to their business and tells a story about their customers. We then use it to enhance campaign performance and user experience. While this data is key for building successful digital campaigns, it’s also reliant on customer data. Given the sensitivity of personal information and how easily it can be abused, we place a strong emphasis on its value and keep it tightly secured out of respect for the privacy of our clients and our clients’ customers. As technology continues to evolve, so will regulations around its uses. At Search Optics, we strive to stay ahead of the curve, turning change into opportunity. As we continue to develop tactical strategies to keep up with the digital evolution, we will to elevate the customer experience and continue to deliver optimal results to our clients. *Facebook's policy change in the US and Australia goes into effect on June 30th, 2018. Canada Advertising regulations have never allowed for the use of Partner Categories in targeting, so no changes are required. Countries within EU will end partner category targeting on May 25th in response to GDPR, unrelated to Facebook’s policy update. Campaigns built prior to June 30th, can run through September 30th – for details, please contact your account manager or digital provider.